​Commonly seen in Pugs, these two problems often, but not always, occur together. Some Pugs don’t produce enough tears to keep their eyes moist and have KCS. 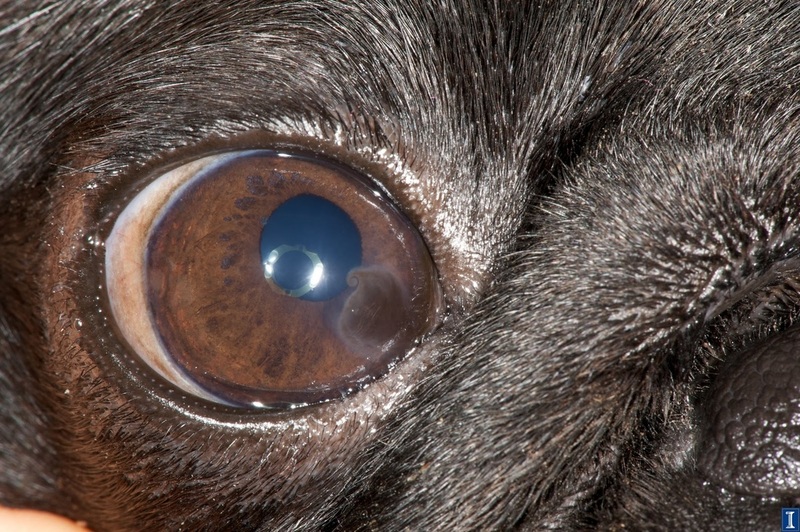 You may see excessive mucous in your Pugs eyes and they may be red. Your vet can do a special test called a Schirmer Tear Test to determine if your Pug is affected. If he isn’t producing enough tears, there are medications available that will stimulate the tear glands to produce more. You usually need to keep the excess mucous flushed out of the eyes as well. With PK, owners sometimes see dark black spots on the cornea or clear part of the eye, especially in the corner near the nose. Sometimes there is just a little bit near the inside corner, but some Pugs have the pigment cover their corneas and they are blind. 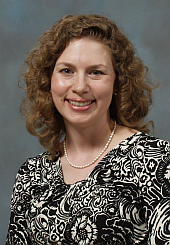 Medications can help keep the eyes moist and disperse the pigment. Both of these problems require life-long therapy. 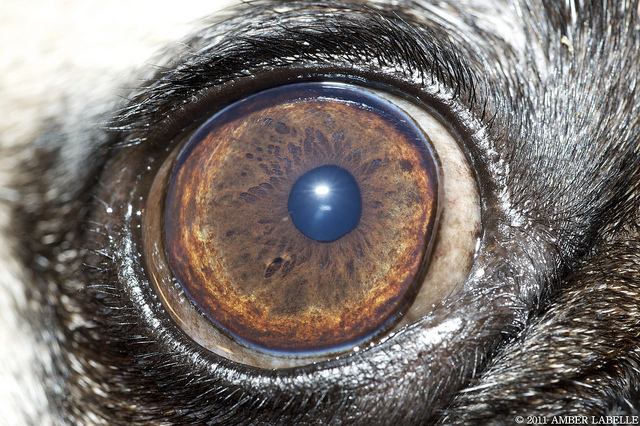 A normal pug’s eye has a clear cornea with no pigmentation to impair vision. Note that the cornea is crystal-clear with no pigmentation, scarring or blood vessels, allowing the inside of the eye to be easily visualized. This pug is very mildly affected with pigmentary keratopathy. Note the swirling pigment (brown discoloration) and fibrosis (grey discoloration). Pigmentary keratopathy usually begins at the inside (medial) aspect of the cornea and progresses towards the center of the cornea. 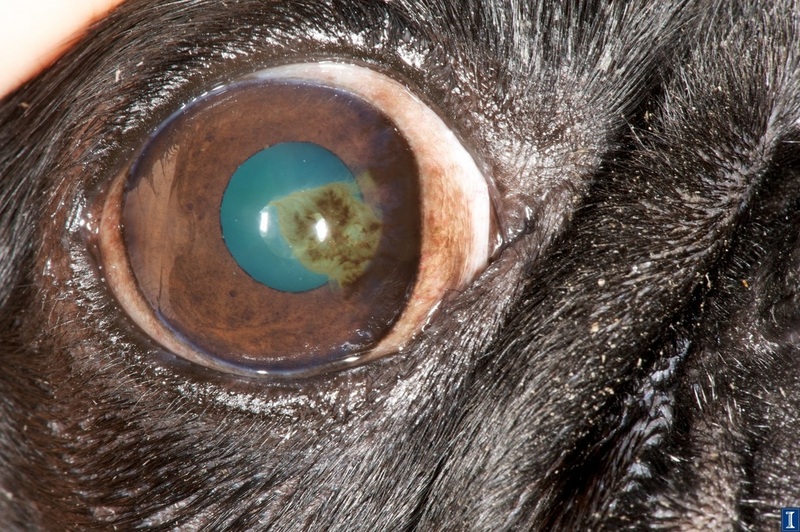 This pug is mildly affected with pigmentary keratopathy. 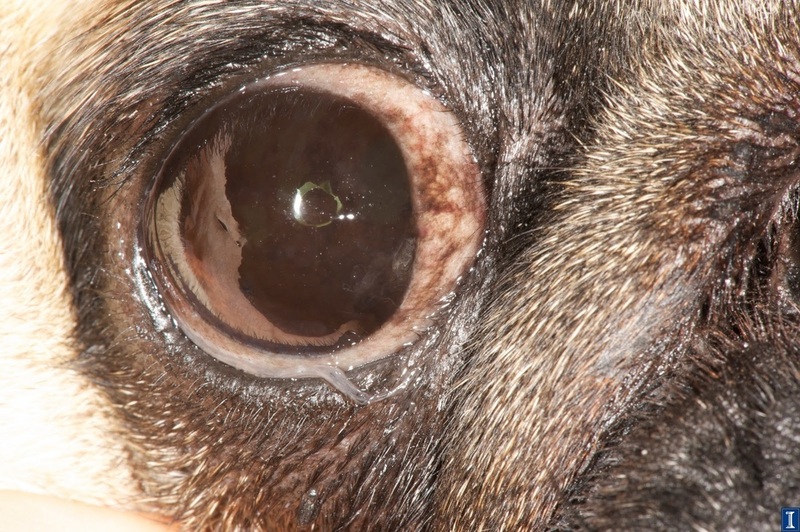 This pug has moderate pigmentary keratopathy. 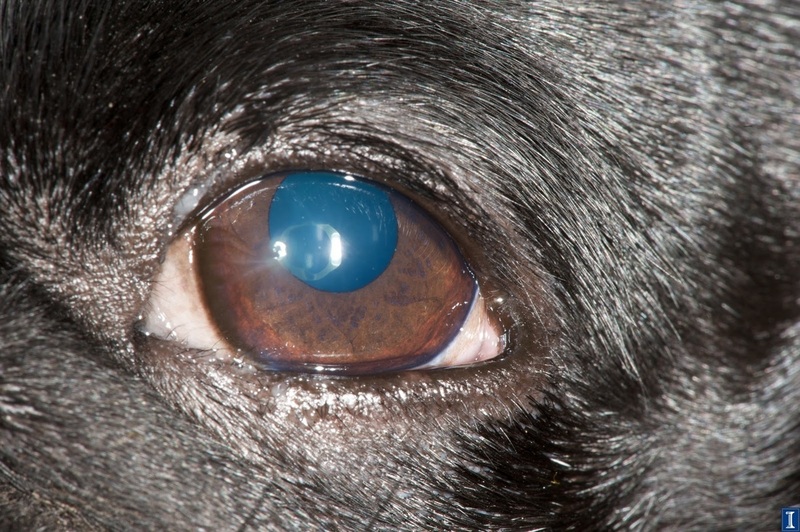 Note that the pigment extends further towards the center of the cornea, causing more visual impairment than pigment that does not extend this far. The pupil has been dilated using eye drops in this photo, causing the tapetal reflection (light bouncing off the inside of the eye) to give the pupil a blue-green glow. This tapetal reflection is normal. 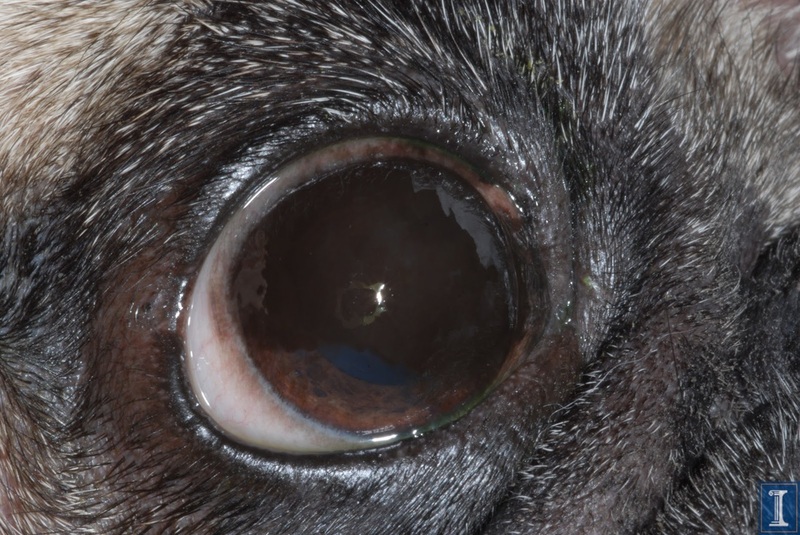 This pug is moderate to severely affected with pigmentary keratopathy. Note the increased density of pigment, extent of pigment towards the center of the cornea, and the decreased ability to visualize the pupil. 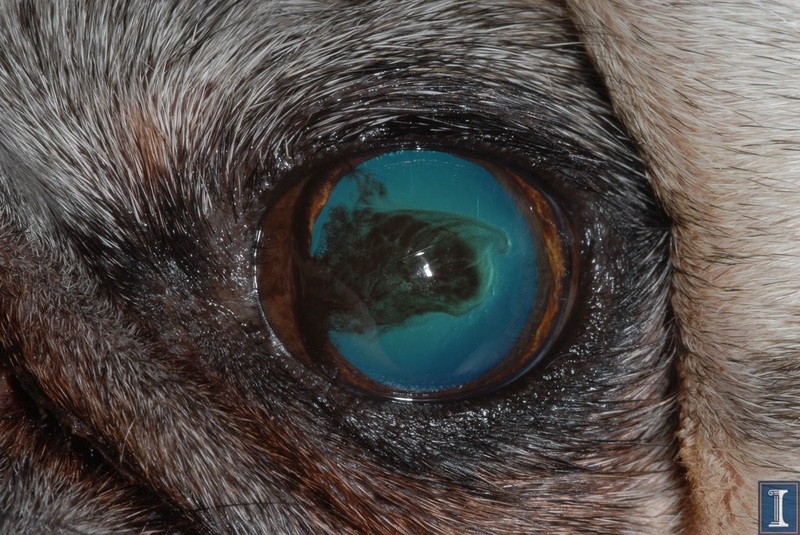 This pug is severely affected by pigmentary keratopathy. Note the extremely dense pigment and that visualization of the inside of the eye is almost impossible. This pug is likely very significantly visually impaired. 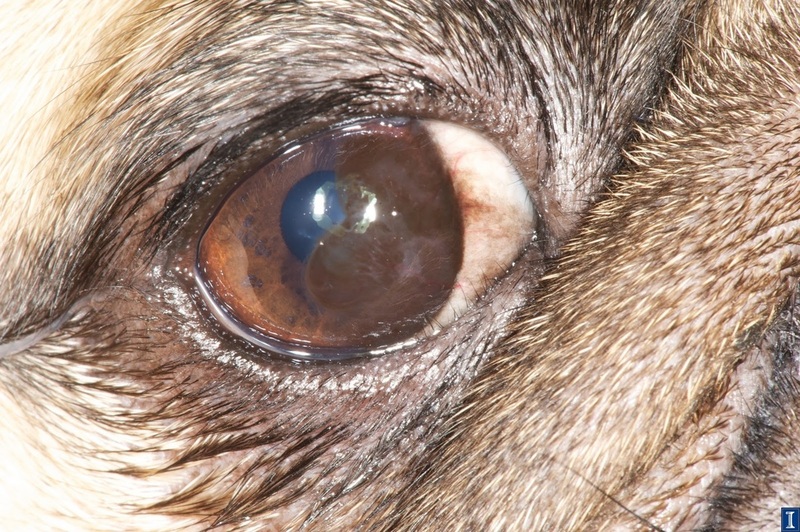 This pug is severely affected by pigmentary keratopathy. Note the density of the pigment and the difficulty in visualizing the inside of the eye. The white reflection on the left side of the photo is a reflection of the photographer’s hand. This pug is likely significantly visually impaired.